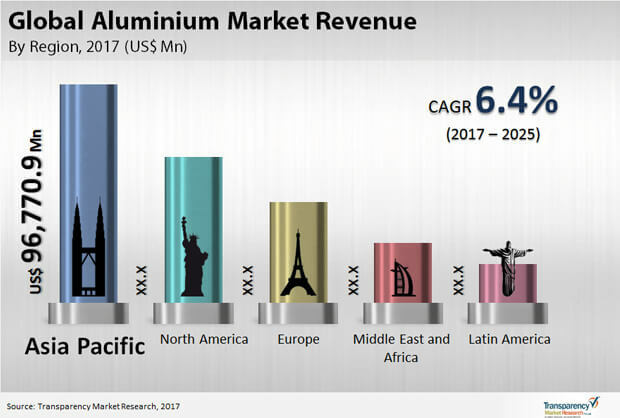 An up to date business intelligence study developed at Transparency Market Research (TMR) has detected that while the global aluminum market continues to attain greater profitability, the competitive landscape is fragmented, with the shares distributed among a large number of small- and medium-sized companies. For some of the well-established players, such as Norsk Hydro ASA, China Limited, RUSAL, RioTinto, and Emirates Global Aluminum PJSC, strategic alliances has been observed as the key mode to gain ground over the rivals. One of the recent and important development in the aluminum market has been the sanctions imposed by the U.S. Government over the Russian company Rusal, which currently is the second largest producers of aluminum in the World. That being said, influx of product owing to increased capacity of China and that itself of the U.S. is expected to fill the void in the near future. If the projections of the TMR report are to be believed, the demand in the global aluminum market will increment at a notable CAGR of 6.4% during the forecast period of 2017 to 2025, with the total opportunities estimated to reflect a revenue of US$249.29 billion by the end of 2025. Based on type of aluminum, the market has been segmented into pure and alloys whereas product-wise bifurcation has been done into sheets and foils, plates, ingots, and cables and wires. As of 2017, the ingots segment emerged as the leading segment. The analyst of the report has also gauged the potential of demand that will be forthcoming from the end users of construction, transportation, foils and packaging, and electrical. Geographically, Asia Pacific is the most lucrative region by a country-mile, with China being the most prominent producer. As of 2016, Asia Pacific churned out over 60% of the total demand share, which can be attributed to the booming construction and automotive sectors across emerging economies of China, India, Indonesia, and Malaysia. Both construction and automotive players are utilizing alloys of aluminum in order to utilize their properties of conductivity to heat with good resistance, durability against rusting, lightweight, and withstanding weather. While the automotive sector is making a shift towards greater fuel efficiency with safer vehicles, the construction industry is feeding off radical manner of infrastructural development across emerging economies. The market for aluminum is also gaining traction from several other industries, including electronics, packaging, and household goods, which is a reflection of versatility of the metal. On the other hand, moderate tensile strength, machinability, and availability of alternatives for diverse end users are some of the restraints that are obstructing the global aluminum market from attaining its true potential. Large number of companies are connected to the value chain, however, a few players to hold considerably stronger position than others. Asia Pacific, with China at the forefront, is expected to remain be the region with maximum demand potential during the foreseeable future.